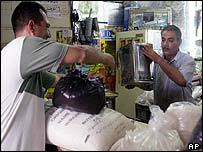 The resumption of Iraq's food ration programme has been seen as a sign of returning normalcy after the US-led invasion. But for Iraqis, depending on handouts, even after 12 years of sanctions, is anything but normal. The refrigerator was completely empty. Not partially empty, with a few leftover eggs, a small block of sweating cheese, maybe a few soft tomatoes. It was barren. All four shelves dark, cavernous and empty. My host, Sanaa, looked embarrassed. "It shouldn't be this way," she said. "I'm educated. I'm a trained engineer. Still, we have no food." A mother-of-four, Sanaa was a petite woman with large eyes and a stomach that curved inwards. She cut a forlorn figure in the darkened kitchen. It was a sweltering Baghdad afternoon. But this middle-class neighbourhood, like the rest of the city, was suffering yet another electricity blackout. Dressed entirely in black - black trousers, black blouse and headscarf - Sanaa said she was in mourning. Not for the destruction wrought upon her country. Her grief was far more personal. "My father died a few weeks ago, during the war, as the bombs were falling on Baghdad," she said. "He was old, yes, but he died from weakness. The sanctions and the wars killed him before his time." But even in her distress, Sanaa was acutely aware of her duties as a hostess. "I would offer you some coffee and biscuits," she said, looking around at the empty shelves. "But..." She trailed off, spreading her hands in a gesture of defeat. Years ago, before sanctions, before Iraq's successive wars, the biggest health problem amongst Iraqi children was obesity. Hunger was never deeply felt. Summer was a time of picnics and garden parties laid out with long skewers of grilled kebabs and platters of rice and lamb so large and heavy, it took two grown men to carry them. Food was once at the heart of Iraq's culture of hospitality. 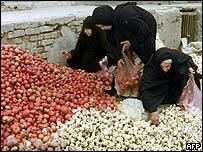 Today, Iraqis are lucky if their potatoes last through the week. Not that potatoes are even part of the government's ration programme. Sanaa showed me the sheet of postage-stamp-sized coupons every Iraqi family uses to claim its monthly rations. "We get sugar, a sack of flour, rice, cooking oil, soap, detergent, milk, lentils and beans," she explained. "But no meat or bread or vegetables. It's very difficult. We can afford meat maybe once a week. But mostly, it's rice and potatoes. Rice I have left over from rations before the war. And potatoes - they're filling and they don't rot easily." The resumption of rations means Iraqi families will have the basics once again. But it's hardly the same as eating well, feeling full and happy and able to cope with daily life. So many Iraqis complained to me of their children going to school hungry; of their daily struggle in the summer heat, feeling weak and tired; of the sick dying for lack of proper food and clean water. All this in a country potentially rich enough to feed itself and others. Today, even the wealthiest Iraqis are struggling. The lucky ones employed in essential services, like electricity boards, schools and hospitals occasionally receive $20 handouts and a dose of humiliation. They're lined up by their new paymasters and photographed by the world's media - all to prove that Iraq is returning to normalcy. And what can you buy for $20? In the market, a scrawny chicken costs $2. A kilo of lamb $3. Vegetables are considered poor value for money since they rot so quickly in the heat. 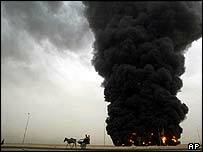 And petrol - bubbling from the ground in Iraq, but suddenly as scarce as Saddam Hussein. Rather than queuing day and night for petrol many people have simply abandoned their cars. A taxi ride to and from work costs $4. Multiply that by five days, and your $20 salary may well have never existed. Sanaa tells me of a relative who was first forced to sell all her jewellery, the pride of any Iraqi woman. Then the family's furniture: the couches, beds, wardrobes, chairs and tables, and finally, the rugs, even the books, to pay for her husband's cancer treatment. He died, leaving the family alone and destitute. "The Iraqis," she says, tears of frustration filling her dark brown eyes, "our spirit has been broken. "The Americans promised us freedom. George Bush said he would liberate us. I want more than liberation. I want to buy my own food in the market. I want a decent job, a salary. "I don't want to keep a gun in my house to shoot thieves and looters. My children want chocolate and biscuits. Why should we trust the Americans? They are hiding in the Ministry of Oil. They have no idea what our life is like." It was difficult not to feel Sanaa's frustration. I imagined my own life in London interrupted by armed gangs, and the lack of food and electricity. Yet none of the Iraqis I met expressed even a trace of hatred or contempt for the West or for Westerners like me. Despite the misery induced by a Western-led war, they were deeply friendly and hospitable. If there is a measure of hope for Iraq, it lies in the generosity and skill of people like Sanaa. The doctors, teachers, engineers and technicians who have volunteered to keep Baghdad's limited services running. As I left her empty kitchen, Sanaa gave me a motherly hug. "Next time you come," she said. "Insha'allah, we will have more to offer you."